Was late 80's Batman REALLY this bad? Maybe I'm getting ahead of myself a bit here with the conclusion at the beginning of the review, but I kept asking myself that same question the whole time I was reading this issue. For a storyline that regularly hits "Top 10 Best Batman Stories" lists, I have to wonder if perhaps past controversy and almost 30 years of passed time have painted this story with a rosier hue than it deserves. Let's start with the story itself. In a nutshell, Robin (Jason Todd) is getting a bit out of hand and Batman decides to take him off duty until he can get his head straight. Jason comes across a box of his parent's old papers and discovers that his mother was not his real mother, and tracks down 3 possibilities. . .all of them in Africa, so he decides to go hunt down his real mother without Batman. The Joker escapes Arkham Asylum (again) and decides to sell a cruise missile that he just happens to have lying around to Middle Eastern terrorists in order to rebuild his lost fortune. Batman gets wind of the scheme and follows Joker to Beirut. . .where, by coincidence, Jason is ALSO tracking down the first woman who might be his real mother. Batman and Jason run into each other. . .purely by coincidence. . .when it turns out that. . .by a strange coincidence. . .Batman's lead and Jason's lead are together. They team up as Batman and Robin to follow and. . .by coincidence. . .discover that both are involved in Joker's nuclear missile deal! In the end, Batman and Robin take down the terrorists, the missile is destroyed, Joker escapes, and Jason finds out that his lead isn't his mother. . .she's just a run-of-the-mill super-secret Israeli intelligence agent that was in his father's address book by some strange coincidence. Batman decides to team up with Robin and help him investigate the remaining two leads. The End, To be Continued. . .
That's a lot of story packed into 44 pages, I'll give it that. Unfortunately, it's not a lot of great story. The dialogue is stilted, the story is completely propped up by a laughable series of coincidences, and there are some utterly ridiculous plot points that are just sort of rushed by. . .such as the Joker speaking fluent Farsi and being able to pilot a C-130 cargo plane. . .not to mention being able to assemble and dissemble nuclear missiles, making him a linguist, a pilot, and a nuclear engineer in one issue! It's bad. The story in this issue is bad. The art is okay, but not much better than that. If I was asked to describe the art in this issue with one word, it would be "Workmanlike". It doesn't take any chances. Aparo has always had a problem with faces, in my opinion. Without masks, his characters all pretty much resemble each other. I have to say that he DOES draw an awesome Batman when he's suited up, but out of costume, not very impressive. There isn't a single page or panel in this issue that really stands out or is memorable in any way. It's just. . .workmanlike. Utterly average. Overall, for a story that's praised for being one of Batman's best. . .I just don't see it. It's clunky, entirely reliant on coincidence, and has average art. The second issue into this often-praised storyline doesn't give me any more confidence in internet top 10 lists than the first issue did. To summarize the story at hand. . .
Batman and Robin travel back to Beirut to beat the location of Lady Shiva out of the criminal underground. They discover that she was taken captive by terrorists and head out for the rescue. The Joker heads to Ethiopia where. . .by coincidence. . .he just HAPPENS to have had past dealings with the third woman who is possibly Jason Todd's mother and blackmails her into stealing medical supplies for him. Back in Lebanon, Batman and Robin take out an entire camp of terrorists only to discover that Shiva wasn't a captive, she was their instructor. She decides to take the opportunity to test her skills against Batman while he happens to be there, but Batman and Robin manage to take her out with the help of Robin sucker-punching her in the back of the head. They inject Shiva with some truth serum and find out she's not Jason's mother either. . .so it's off to Ethiopia! Batman and Robin track down Dr. Sheila Heywood in a refugee camp and *Insert best Maury Povich voice here* "She IS the mother." Jason does a happy dance and the audience goes wild! Unfortunately. . .and by complete coincidence. . .Jason discovers his new mom's involvement with the Joker and follows them to a warehouse full of medical supplies before deciding to bring Batman in on the action. Batman follows trucks full of Joker gas with the fold up mini copter he just HAPPENED to bring along while Robin watches the warehouse. Robin says, "Screw this sitting around!" and goes in for the rescue. . .unfortunately, his mom betrays him and sells him out to Joker, who beats him with a crowbar and then leaves Jason and his Mom in the warehouse with a bomb. Jason tries to come to the rescue, but is too weak and too late. The bomb goes off JUST as Batman arrives back on the scene. The end, to be continued. . .
Once again, a LOT of story packed into one issue. But that's how they rolled back then. What would take a year to tell now, they crammed into 4 issues. But like the first issue, even though there's a lot to it. . .there's not a lot that's good. There's two wasted pages worth of exposition 'splaining what happened in the last issue for starters. Then there's the stilted, sometimes hokey, dialogue (who the hell in the 80's still called young men "lads" outside of the U.K.?) and the story's complete reliance on coincidence. I have to admit that the heel turn by Robin's mom was an actual surprise, but other than that, this was pretty bad. The art is pretty much the same, utterly average work as in the first issue, and pretty much what I expect from Jim Aparo. . .a great Batman in costume, everything else not so great. I have to admit that the page of Joker beating Robin with a crowbar DID definitely stand out, and I can see why that particular page is considered iconic, but the rest of the art in this issue is nothing but average. 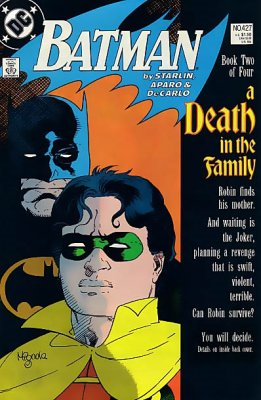 Overall, except for the unexpected villain turn of Robin's mom and the one single outstanding page of art with Joker beating Robin, this issue of "Death In The Family" was average at best. The third issue of "A Death In The Family" returns to regular 22 page size, so there's not quite as much packed in. Not sure why they quit with the double-size issues on this story, but I have the feeling that they either wanted to stretch it out to 4 issues or maybe they just had four SWEET Mignola covers and didn't want one to go to waste. In any case. . . The story starts off with Batman searching the ruins of the warehouse that Joker 'sploded with Robin and his crappy mom inside. Batman's search quickly turns into about 6 pages of flashback exposition going back to when he first met Jason up until the events of the previous issue when Robin finally disobeyed one order too many. 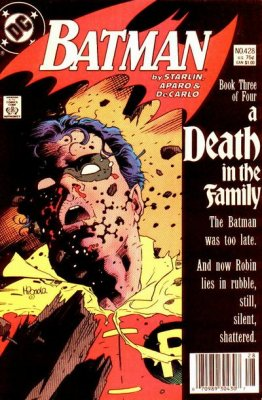 He comes across Dr. Heywood, who gives a dramatic final monologue about what a hero her son was before dying, and then he finds Robin and we get that iconic full page of sad Batman carrying the limp, bloody body of Robin out of the ruins. Bruce Wayne makes funeral arrangements and then decides it's time to take down Joker once and for all. Following a message left for him, Batman heads to U.N. Plaza only to be met by Superman, who was sent by the State Department to keep Batman in line because SURPRISE! The new Iranian Ambassador is The Joker and he has diplomatic immunity! The end. . .to be concluded. Okay. I'll admit that the scenes of Batman searching the rubble and finding his dead partner are outstanding and iconic. . .but they take up about 3 pages. The rest of this this issue is full of exposition and probably the worst twist of the whole story with Ambassador Joker. The confrontation between Batman and Superman is drawn out too long and except for a pretty funny "You're gonna break your hand on my face, Bruce." moment when Batman takes a swing at Superman, just seems like an excuse to throw Superman into the story. The art, with the exception of a few panels, including that iconic full-pager of Batman carrying dead Robin, remains painfully average. Aparo's trouble with faces is obvious when Superman looks EXACTLY like Bruce Wayne, all the way down to his hairstyle. Overall, a ton of exposition, an extremely cheesy twist, and (mostly) dull art makes this issue average at best. But since it's not double-size, at least it's a pretty quick read. 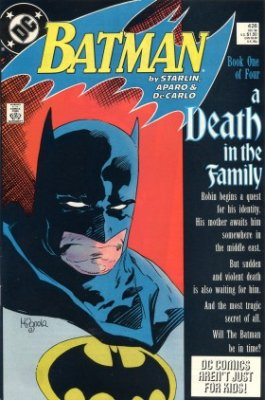 And so we come to the fourth and final issue of the legendary "A Death In The Family" story. . .and I say Thank God It's Over, because (except for a few scattered moments) it's been pretty bad. Let's do this! So here's the story: Batman gets informed by the State Department that he is to leave Joker alone or Superman will be there to take him down. Batman basically tells the most powerful being on earth to sit and spin, as Batman will tend to do. We get some nice scenes of Batman starting to crack around the edges and deciding it's finally time to not only stop the Joker, but to KILL him. He knows Joker has something planned for the U.N. General Assembly, so he manages to get in as Bruce Wayne and wait for his chance to strike. Sure enough, Joker unleashes his Deadly Joker Gas™ on the assembled delegates, but Superman is there in disguise and huffs all the gas in the room up like he's taking the mightiest bong swat in history. As he flies off to blow the smoke somewhere safe and enjoy the high, Batman takes over. It all ends with Joker running for his life from a deranged Batman out for blood. The chase ends in a helicopter above the ocean where one of Joker's henchmen sprays the cabin with gunfire, hitting Batman, Joker, and the pilot. . .oops! The helicopter crashes and Superman returns to save Batman while he shouts at Supes to ignore him and find Joker instead. Of course, they don't find a sign of Joker and the story ends with a grim and gritty solo Batman. This was probably my favorite issue of the four. . .but even given that, it barely elevated itself above "pretty good". I liked "Vengeance Batman" a lot, and there was some good internal dialogue going on as he finally broke and decided enough was enough. Unfortunately, the whole "Ambassador Joker" setup was a pretty cringeworthy plot device. Speaking of cringeworthy, Aparo's art remained just as sub-par on this issue as on the previous 3. Batman and Bruce Wayne look exactly alike, and Aparo's helicopter was laughable. That guy has real problems with faces and vehicles. One wonders just how the hell he managed to stay on as one of DC's main artists for so long. I'll admit he draws an excellent Batman in cape and cowl, but everything else? Average to bad. Overall, this was a pretty good end to the story. I think maybe the thing I liked best about it is that Batman was the loser in this one. It's not often we see a story where Batman doesn't win against all odds. Overall, I found "A Death In The Family" to be pretty bad. It had moments here and there, but nothing to justify the reverence shown to the story on multiple "Best Batman Stories" lists. When you take a close, fair look at it for what it is, one finds a story padded with exposition, hokey dialogue, and completely propped up by a sequence of laughably improbable coincidences. . .not to mention plot devices (Joker as Iranian Ambassador with Diplomatic Immunity for one glaring example) that severely test even the most flexible suspension of comic book disbelief. While the covers by Mike Mignola are fantastic, the interior art by Jim Aparo is utterly average and workmanlike, with only a very few scattered panels ever elevating themselves above the rest. Although this story may have a place in comic book history, I found it to be average at best and pretty bad in general. 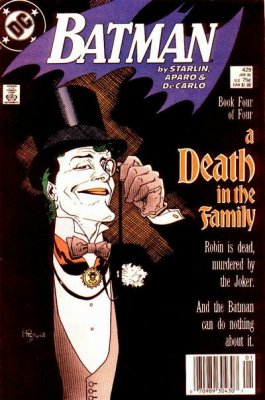 "A Death In The Family" has definitely coasted into comic history on notoriety, not quality. It's been a while since I threw down on an entire series. Topps X-Files. All 41 regular issues, plus annuals and specials!